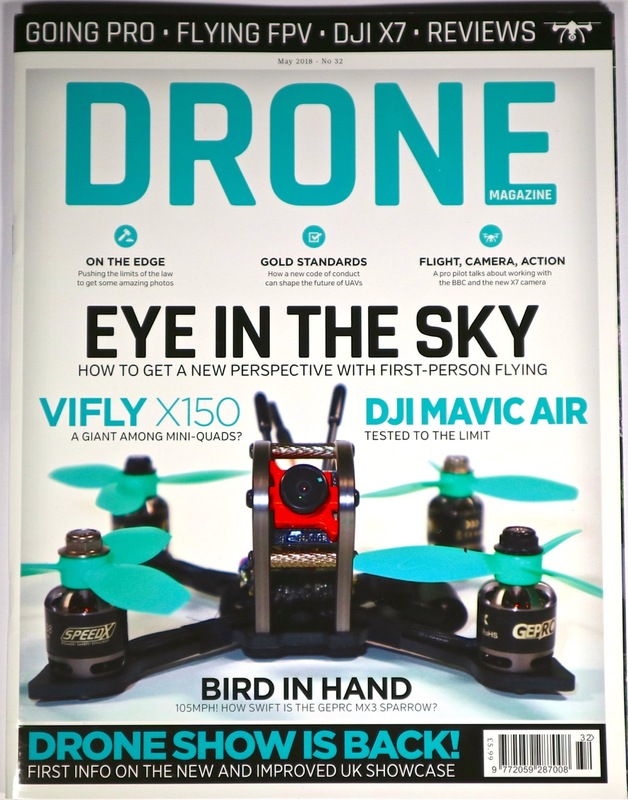 This was the second piece from Drone Magazine for May 2018, and was the cover picture. It was also a case of being able to reuse assets I’d created when reviewing for YouTube. Since I started writing as well, from this point onwards I’ve always taken stills of anything that could be reviewed as I go. Although, this has the side-effect of slowing down my work rate as well. 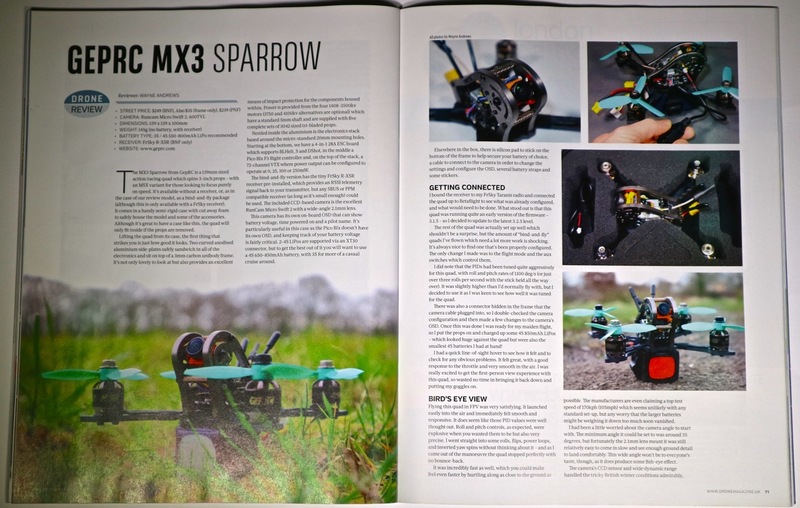 I really loved the Sparrow, I still do – it’s seriously fast and it flies superbly. I’ve used it in a bunch of YouTube videos – for testing onboard DVRs and small HD cameras, but to save space, here’s the original review video I posted. 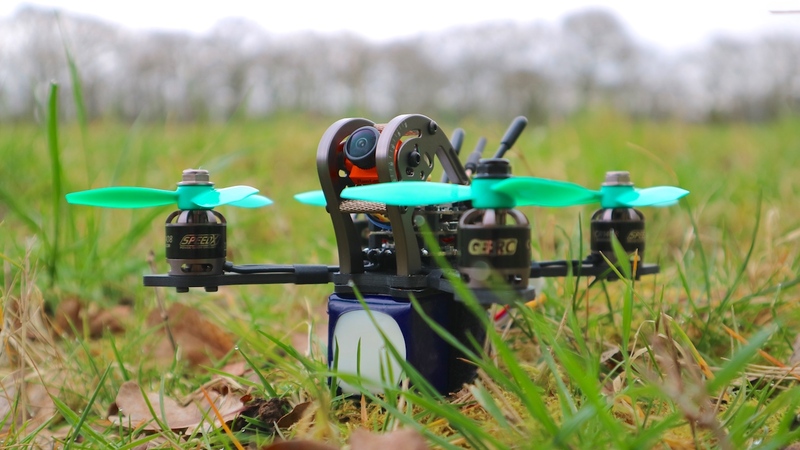 The MX3 Sparrow from GepRC is a 139mm sized racing quad which spins 3” props. 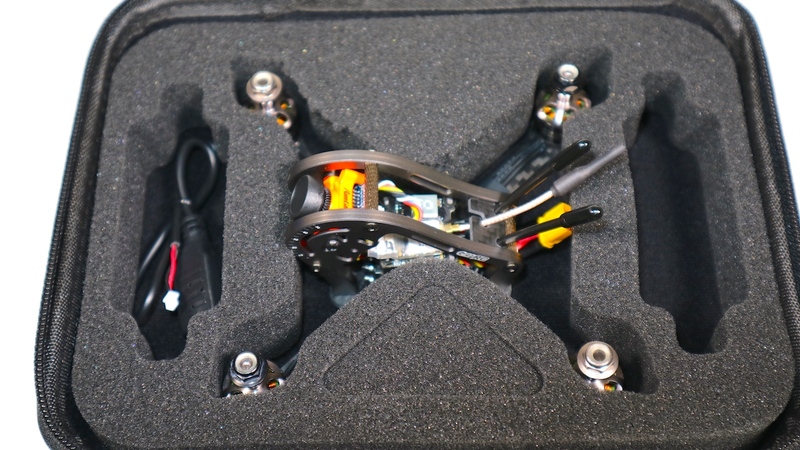 It’s available without a receiver, or, as in the case of my review model, as bind-and-fly (although this is only available with a FrSky receiver) I comes in a handy semi-rigid case with cut away foam to safely house the model, and some of the accessories. Although it’s great to have a case like this – the quad will only fit inside if the props are removed. Lifting the quad from it’s case, the first thing that strikes you it is just how good it looks. Two curved anodised aluminium side-plates safely sandwich in all the electronics and sit on top of a 3mm carbon unibody frame. It’s not only lovely to look at, but provides an excellent means of impact protection for all the components housed within. 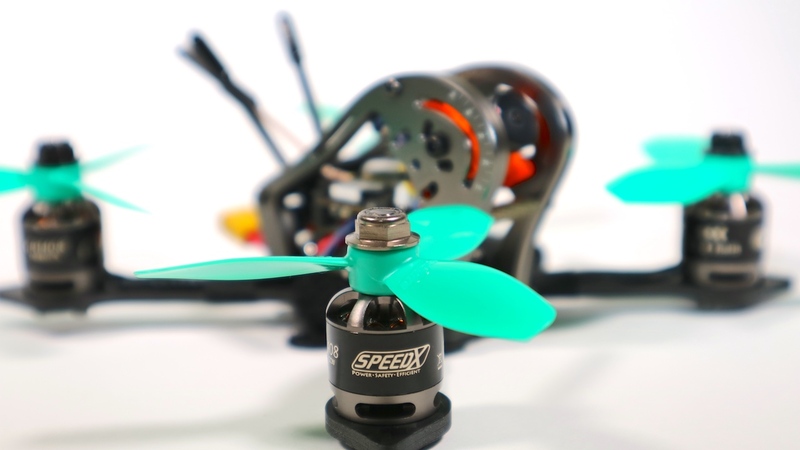 Power is provided from the four 1408-3500kv motors which have a standard 5mm shaft and are supplied with five complete sets of 3042 sized tri-blade props. Nestled inside the aluminium is the electronics stack based around the micro-standard 20mm mounting holes. Starting at the bottom, we have a 4-in-1 28A ESC board which supports BLHeli_S and DShot, in the middle a Pico Blx F3 flight controller, and on the top of the stack, a 72 channel VTX which power output can be configured to operate at 0/25/100/250mW. 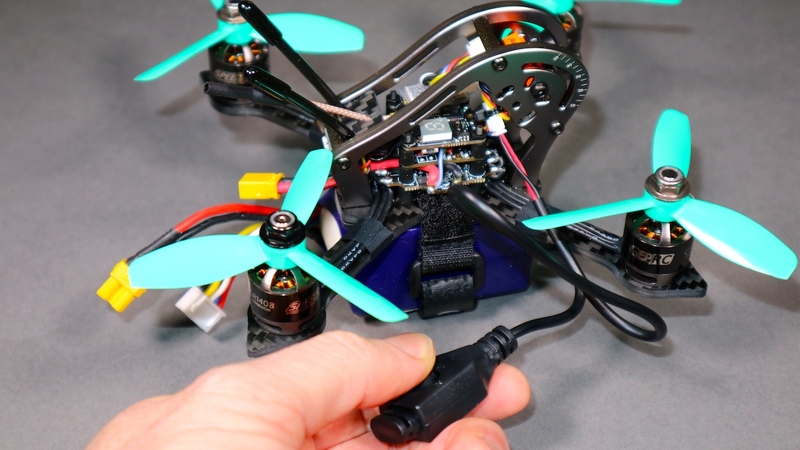 The bind-and-fly version has the tiny FrSky R-XSR receiver, pre-installed which provide an RSSI telemetry signal back to your transmitter, but any SBUS/PPM compatible receiver (as long as it’s small enough) could be used. 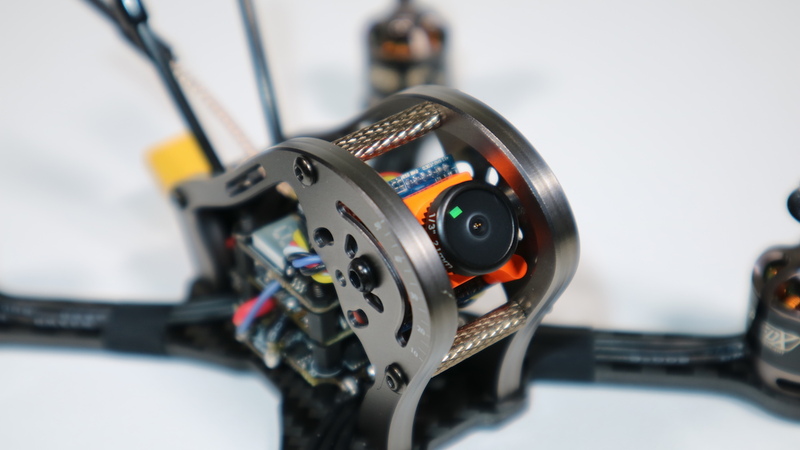 The included CCD-based camera is the excellent RunCam MicroSwift 2 with a wide-angle 2.1mm lens. 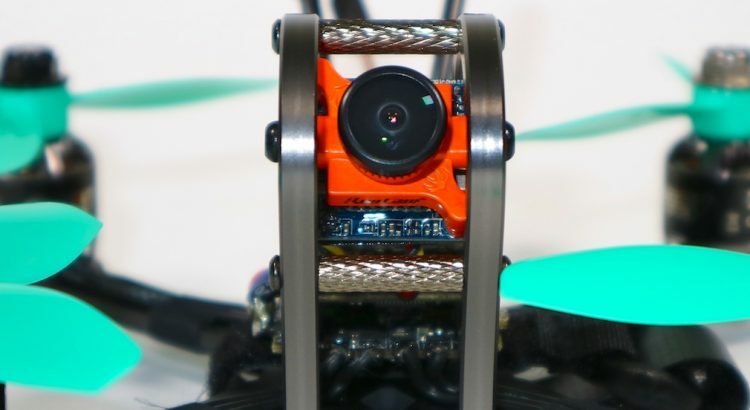 This camera has it’s own onboard OSD that can show battery voltage, time powered on, and a pilot name. It’s particularly useful in this case, as the Pico Blx doesn’t have it’s own OSD, and keeping track of your battery voltage is fairly critical. 2-4s Lipos are supported via an XT30 connector, but to get the best out of it you will want to use a 650-850mah 4s lipo, with 3s for more of a casual cruise around. Elsewhere in the box, there was silicon pad to stick on the bottom of the frame to help secure the lipo, a cable to connect to the camera in order to change the settings and configure the OSD, several battery straps and some stickers. I bound the receiver to my FrSky Taranis radio, and connected the quad up to Betaflight to see what was already configured, and what would need to be done. What stood out is that this quad was running quite an early version of the firmware: 3.1.5 so I decided to update to the latest 3.2.5 level. 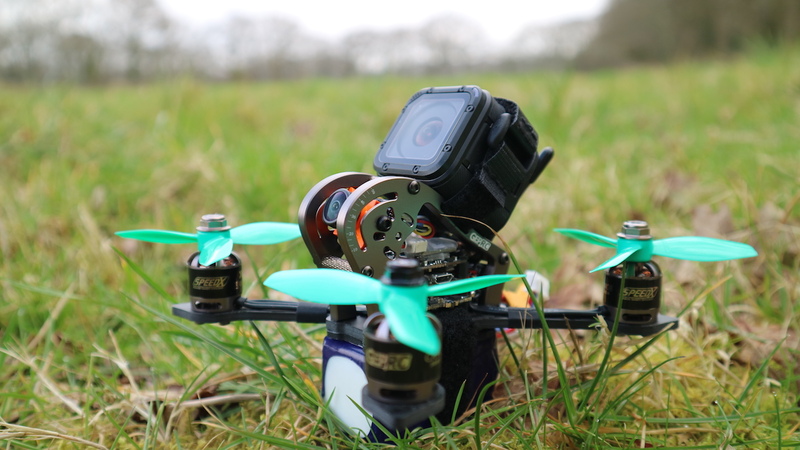 The rest of the quad was actually setup well – which shouldn’t be a surprise – but the amount of “bind-and-fly” quads I’ve flown which need a lot more work is shocking. It’s always nice to find one that’s been properly configured. The only change I made was to the flight mode, and the aux switches which control them. I did note that the PIDs had been tuned quite aggressively for this quad, which roll and pitches rates of 1100 deg/s (or just over 3 rolls per second with the stick held all the way over) It was slightly higher than I’d normally fly with, but I decided to use it as I was keen to see how well it was tuned for the quad. There was a connector hidden in the frame that the camera cable plugged into, so I double checked the camera configuration, and then made a few changes to the camera’s OSD.It was time to maiden, I put the props on and charged up some 850mah 4s lipos, which looked huge against the quad – but were also the smallest 4s lipo’s I had. I had a quick LOS hover to see how it felt and to check for any obvious problems. It felt great – a good response to the throttle, and very smooth in the air. I was really excited to FPV this quad, so wasted no time in bringing it back down and putting my goggles on. Flying this quad in FPV was very satisfying. It launched easily into the air and immediately felt smooth and responsive. It does seem like those PID values were well thought out. Roll and pitch controls – as expected – were explosive when you wanted them to be, but also very precise. I went straight into some rolls, flips, power loops, and inverted yaw spins without thinking about it. and as you came out of the maneuver, the quad to stop perfectly with no bounce-back. It was incredibly fast as well, which you could make feel even faster by hurtling along as close to the ground as possible. Any worry that the 850mah 4s lipos was weighing it down too much soon vanished. I had been a little worried about the camera angle to start with. The minimum angle it could be set to was around 35 degrees, but fortunately, the 2.1mm lens meant it was still relatively easy to come in slow and see enough ground detail to land comfortably. This wide angle won’t be to everyone’s taste though as it does produce some fish-eye effect. The cameras CCD sensor and wide dynamic range handled the tricky British winter conditions admirably, with the sun low in the sky it was still able to expose the ground details correctly instead of causing them to black-out as a CMOS sensor will typically do. I was also pleasantly surprised with the flight times I was getting out of my batteries. I expected around 3 minutes, but I was getting over 4 minutes with some fairly intense speed runs and punch-outs. I wouldn’t have known I was flying a 3” quad, it felt very much like flying one of it’s bigger 5” cousins. It had the agility of a micro with the raw speed of a more powerful setup. The only point I picked up on is that it didn’t quite have that explosive vertical punch-out that a 5” can give you. I did mount a GoPro session onboard, as there was the space to do so – and while it carried it around the field, it did impact on the performance too much to be seriously considered. If you really want to use an HD camera on this quad, it needs to a more light-weight one. 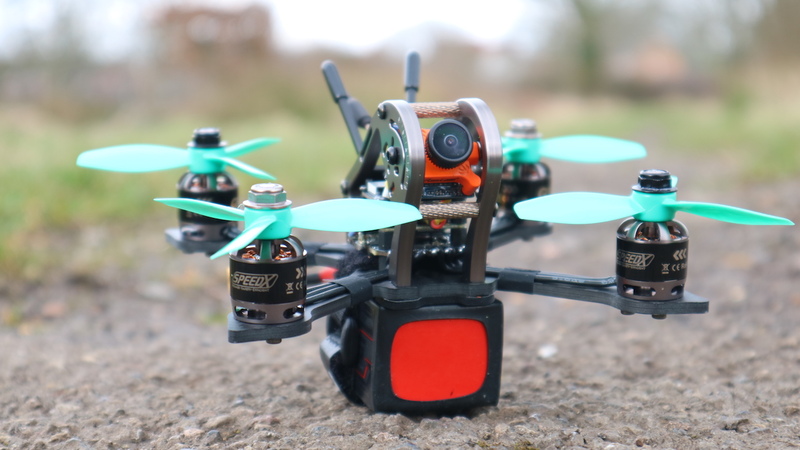 The Sparrow is a stunning looking little quad which performs fantastically out of the box, and weighs in at just 248g with an 850mah 4s lipo, making it quite friendly against the current set of impending drone restrictions. On the critical side, it is a fairly expensive model, and lacks the Betaflight OSD that many BNF models include. Beginners may also truggle with the aggressive camera angle, and will most certainly need to tune down the included rates. Overall though, It’s huge amounts of fun to fly, and should definitely be considered for anyone looking for a good 3” quad to race or freestyle with.